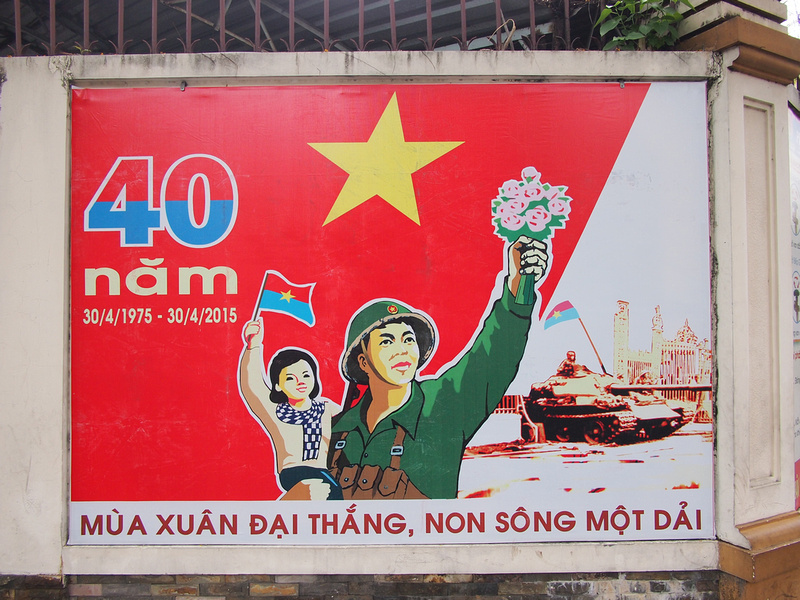 April 30, 2015 marks the 40th anniversary of the day the North Vietnamese Army arrived in Saigon and ended the war. 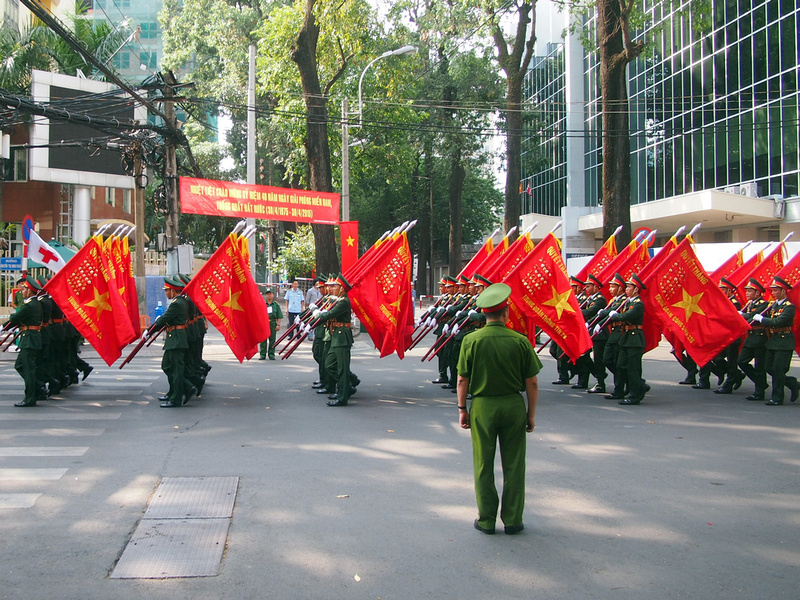 The day is known in Vietnam as liberation day, in the US as the fall of Saigon, and to overseas Vietnamese as Black April. 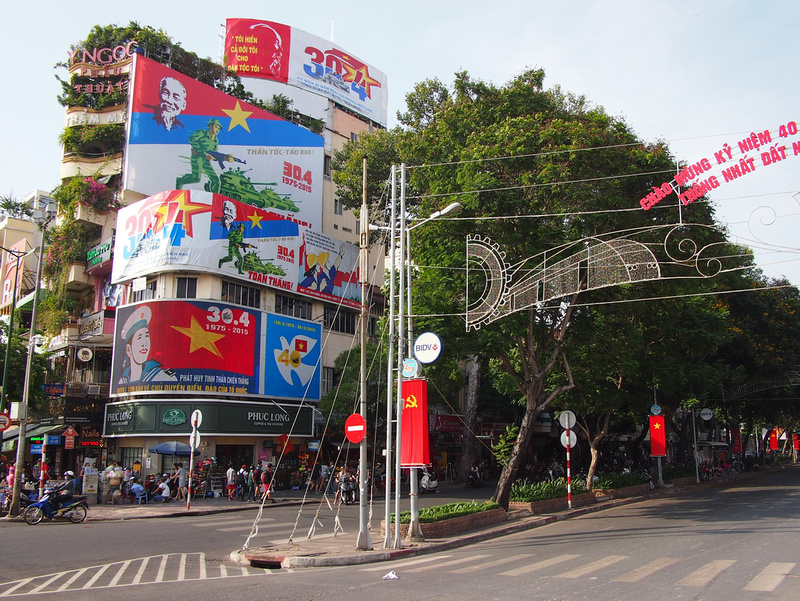 In Ho Chi Minh City (or Saigon) there are hardly any war monuments and there is only one prominent statue of the man the city is named after. 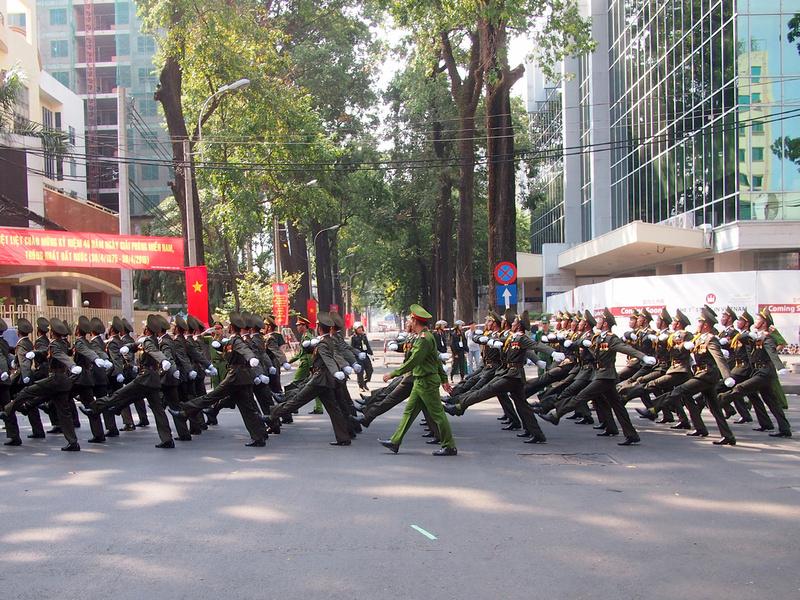 Over two thirds of the population of Vietnam was born after the war and it doesn’t figure in daily life. Why should it – it is now two generations past. 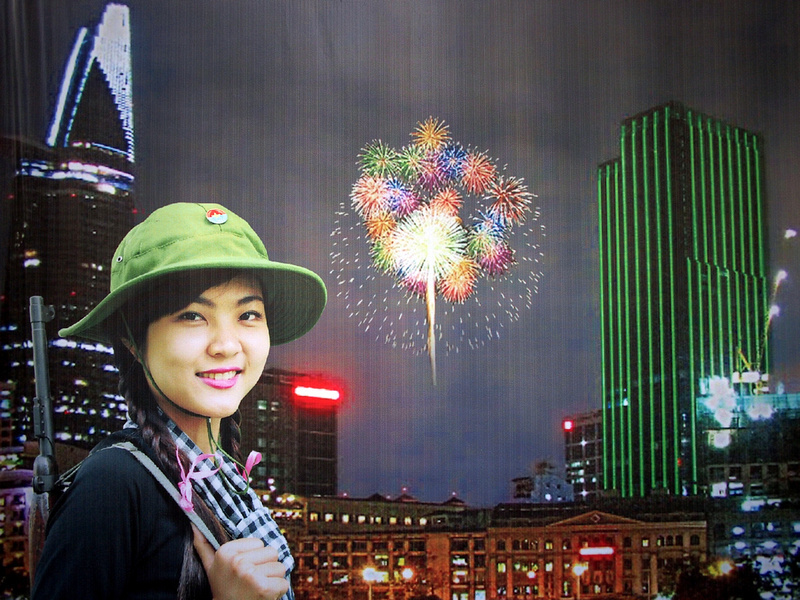 I often ask young people what they think about the war and there has never been any animosity shown towards the US. 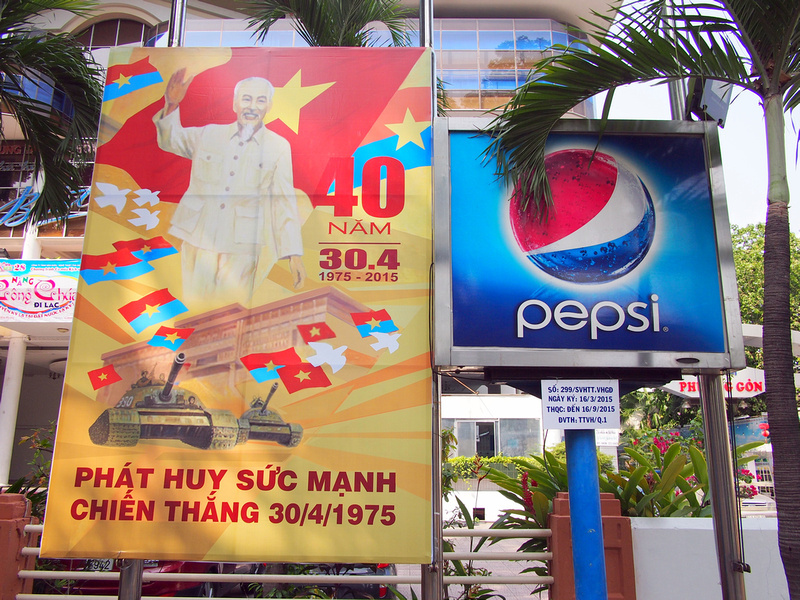 Being in Saigon for the month leading up to the anniversary has been the first time I’ve seen so many reminders of the war in the city. 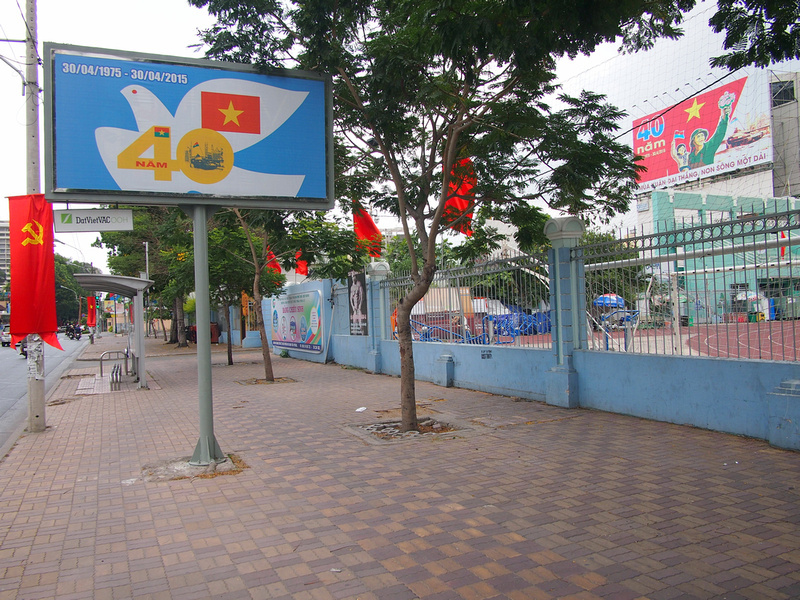 It started before I left in February with the decorating of Le Duan Street with the flag of the Viet Cong next to the Vietnam flag. 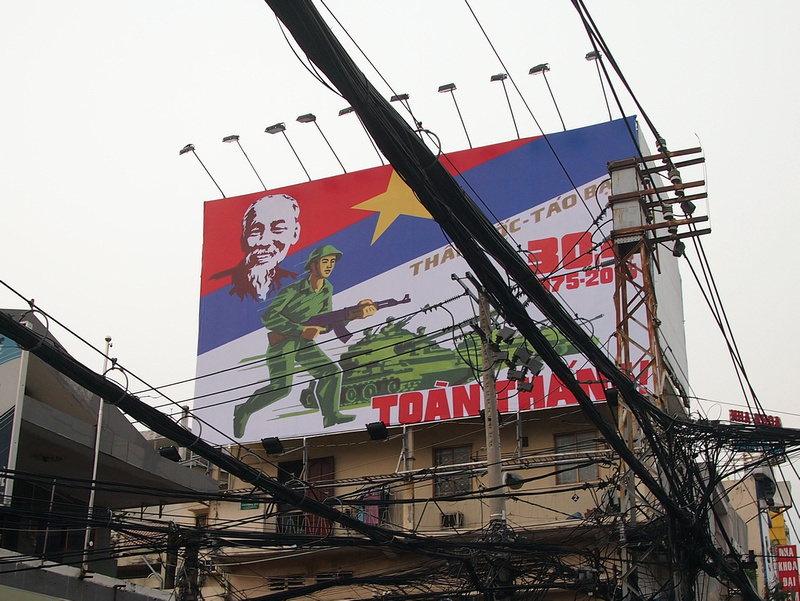 I arrived back in Saigon on the first of April, and in the few months that I was away communist propaganda posters and billboards for the upcoming 40th anniversary had popped up everywhere. 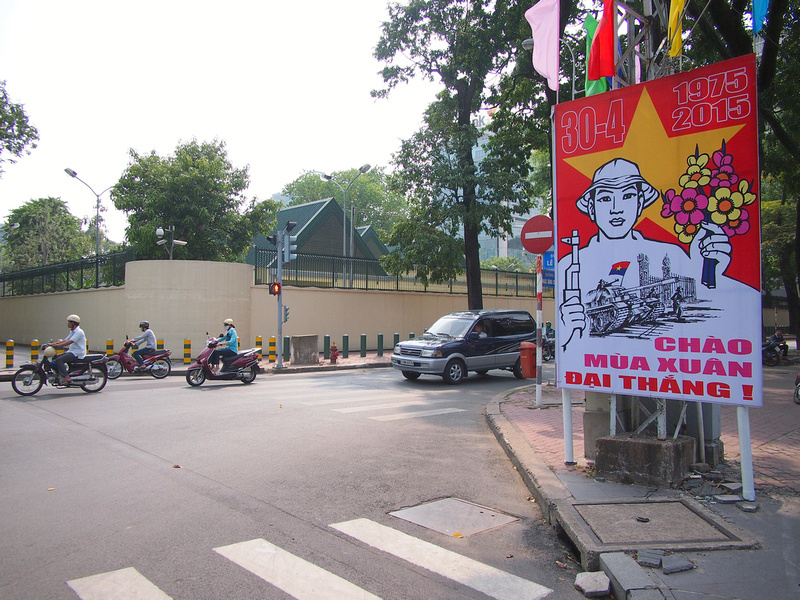 The recurring theme of the posters is the tank bursting through the gates of what was then the Presidential Palace (now the Reunification Palace). 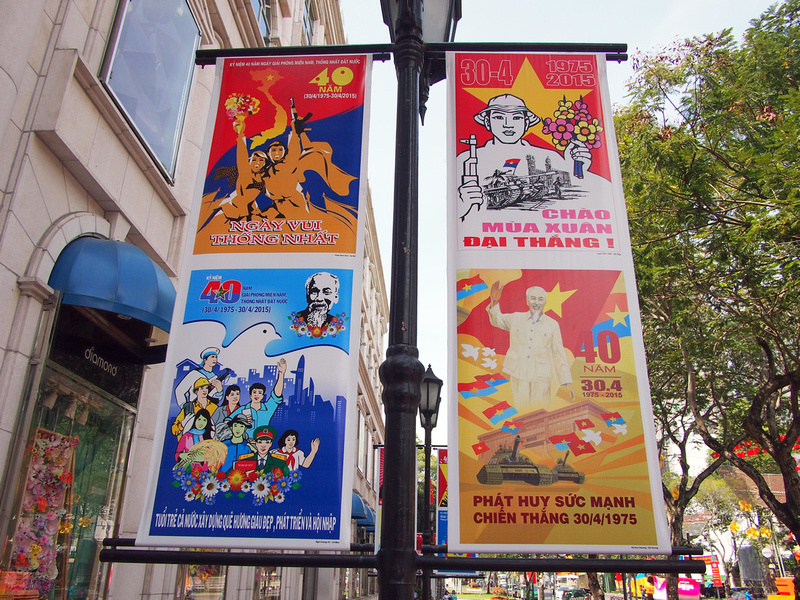 This poster is outside the US consulate, which is on the street that leads to the palace. French consulate is next to the US consulate. 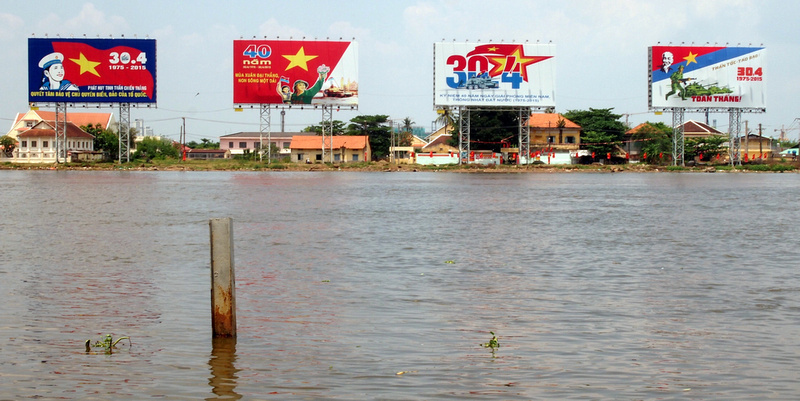 Billboards all over a prominent corner on Le Loi, one of the main streets of District 1. 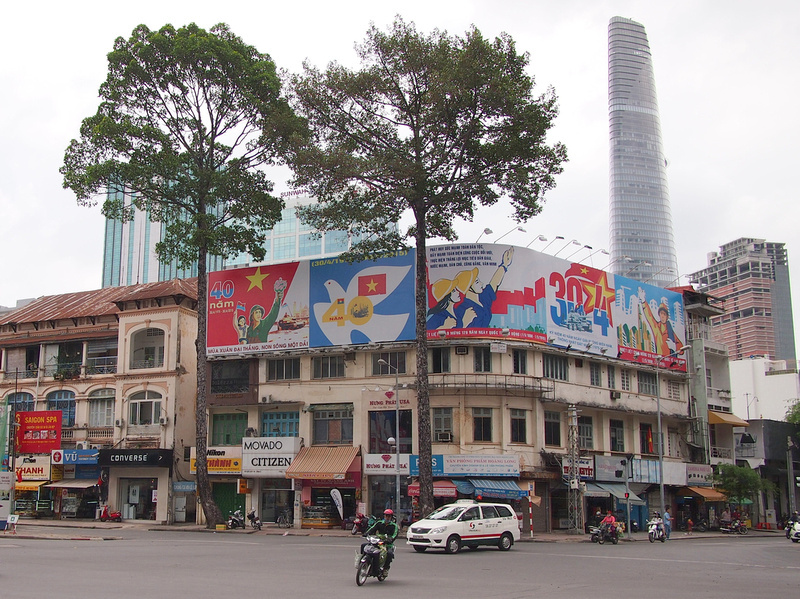 Ho Chi Minh over the Palace. 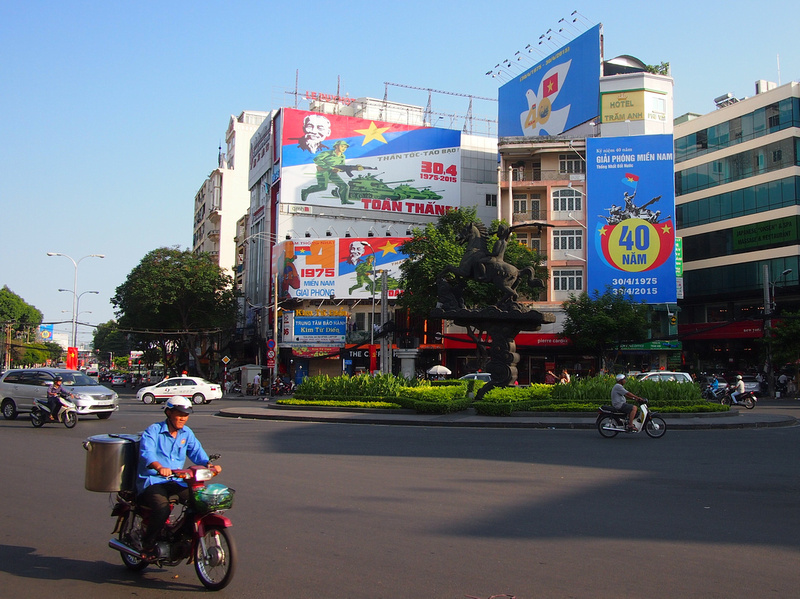 Billboards all around one of the central roundabouts in the city. 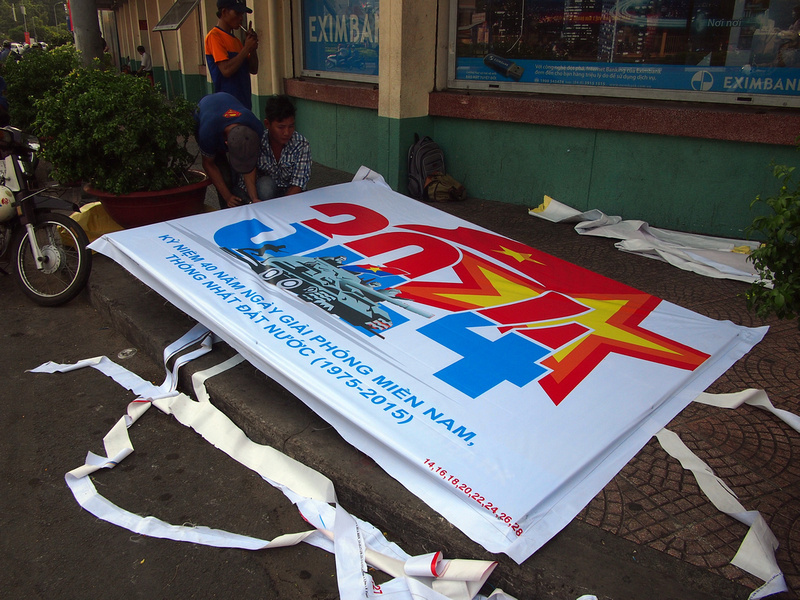 In the days leading up to the anniversary pretty much every billboard space was rented out. 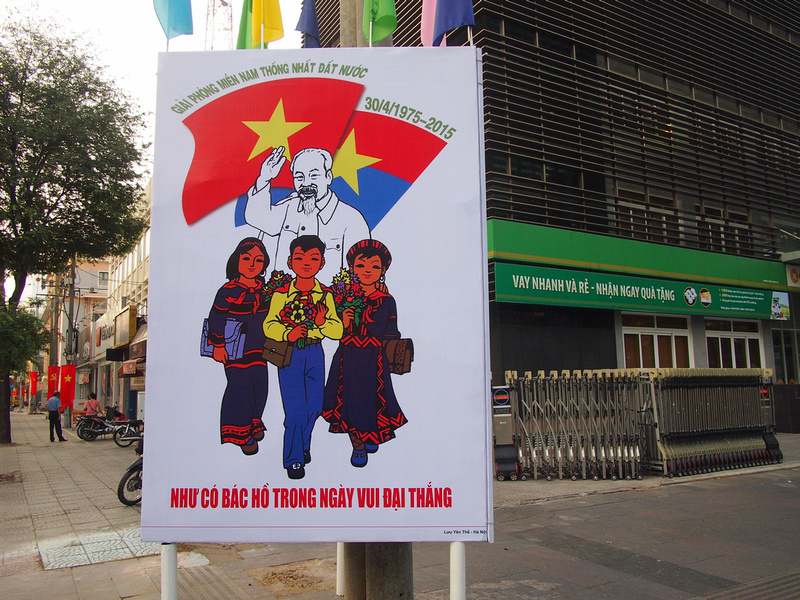 An unusual departure from the usual poster styles, this one with a picture of a young Viet Cong girl. This poster was promoting a pop-up bookstore that was in one of the side streets for a few days, and wasn’t associated with the 30/4 poster series. 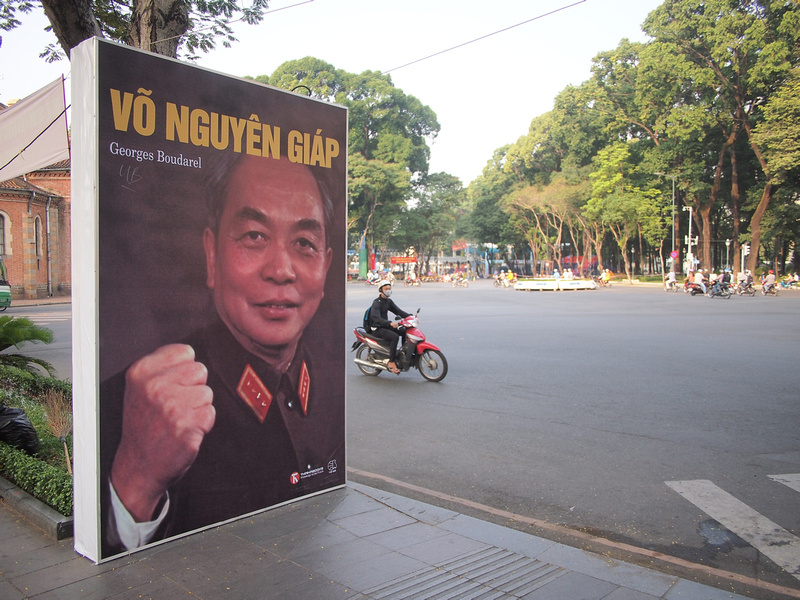 It did make me wonder though why there weren’t any posters of Giap. 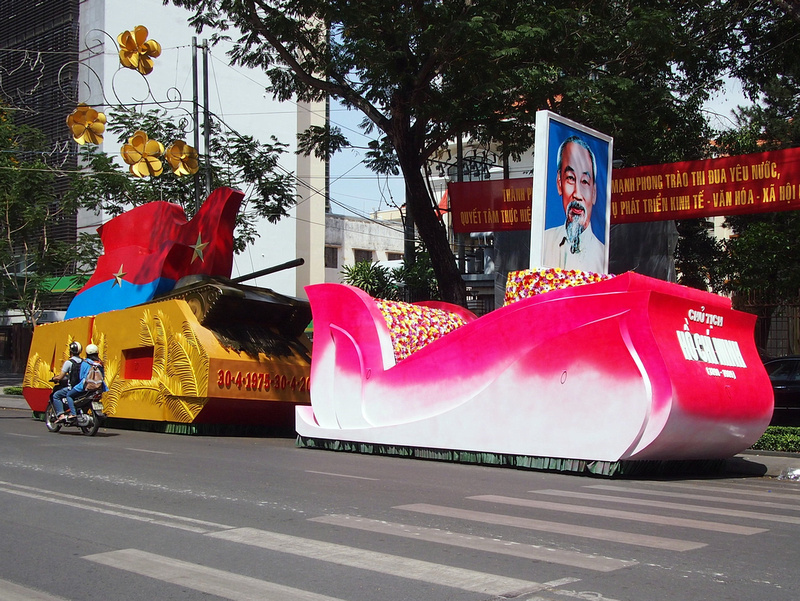 A few days before the anniversary I spotted these parade floats of Ho Chi Minh and the symbolic tank, which turned out the be the only view I got of them. The day before the anniversary I heard that the parade area was going to be blocked off to the public, so I didn’t know if I would see the parade. 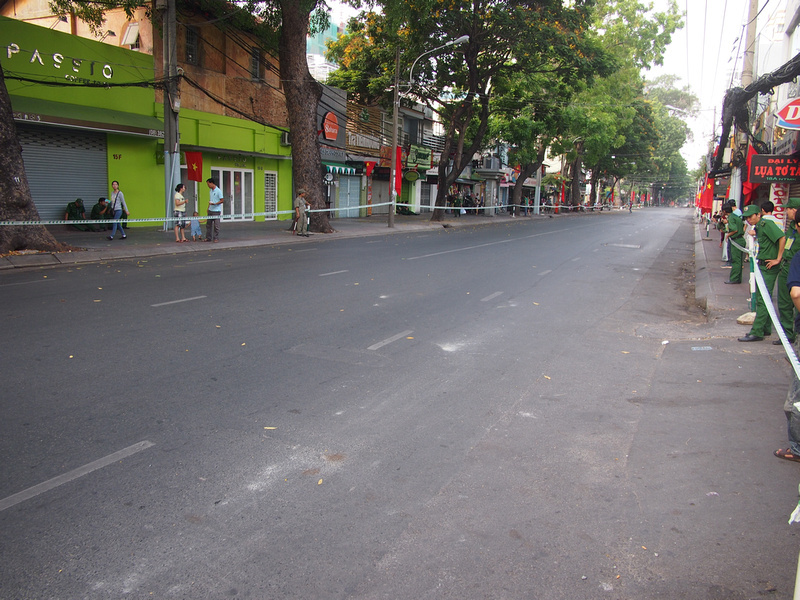 On the day of the anniversary I woke up to see my street devoid of traffic. 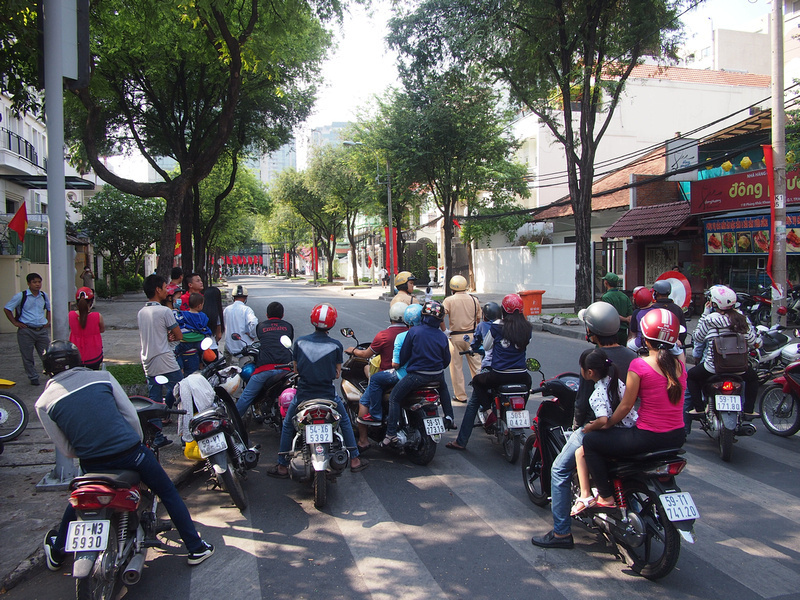 If you know Saigon you know this never happens. 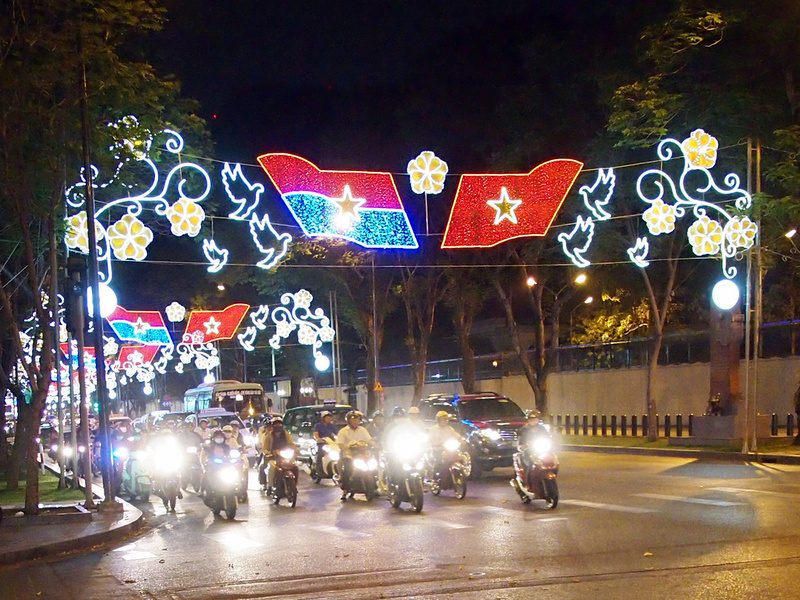 The street I live on is one block parallel to Le Duan, which is the street leading to the Reunification Palace. 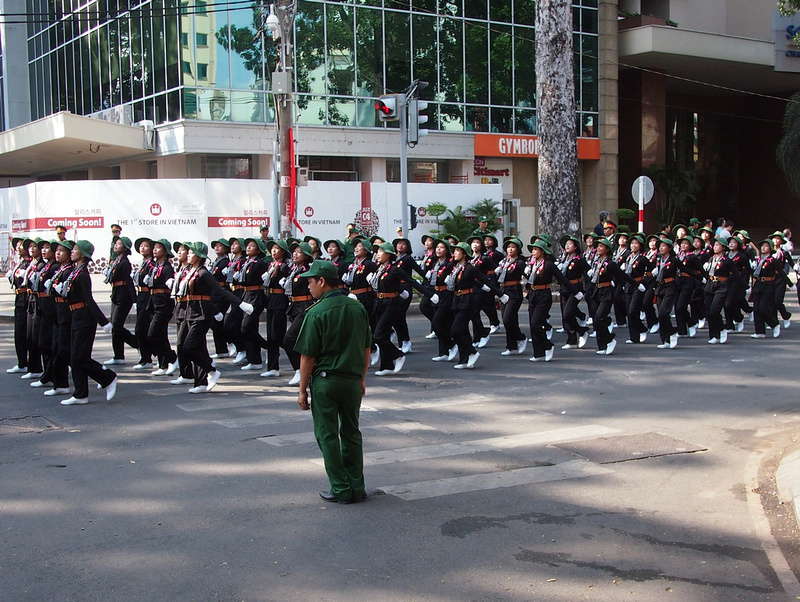 I lucked out in that parts of the parade went down my street (Nguyen Thi Minh Khai) and then looped around to start parading on Le Duan. 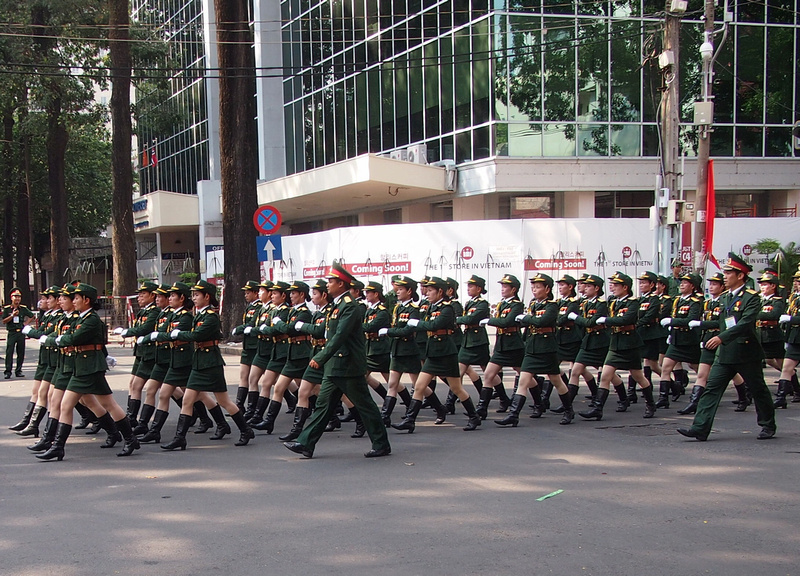 And men in various minority uniforms. During the parade my view was getting blocked by officials and bikes. I wanted to get a better view of the parade so I thought I would just move down to the next block. I assumed that I could at least stand at the edge of this exclusion zone. I went up a block and across one, and then found that I couldn’t reenter. All vehicle and foot traffic was being stopped a block away from the marching route. I walked back to my original location and I couldn’t reenter there either. So that was it for me for the day. 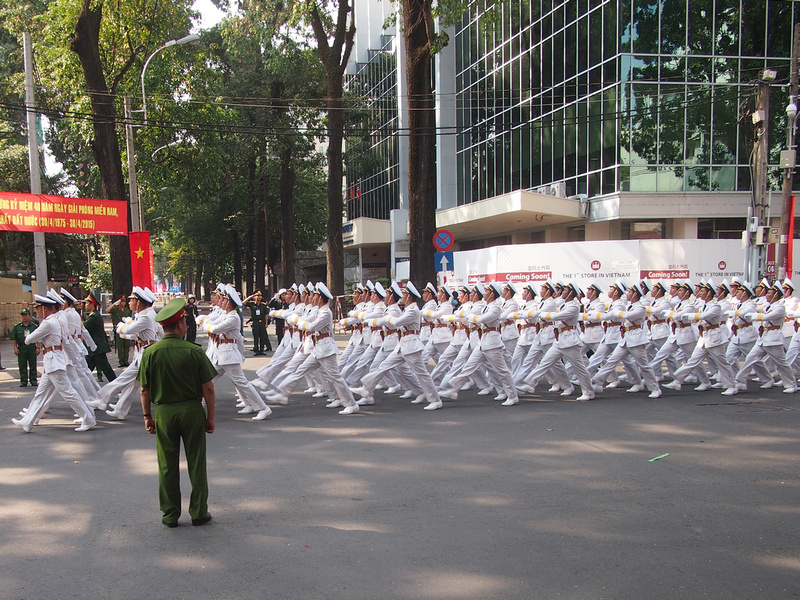 The big parade that you could only watch on TV. 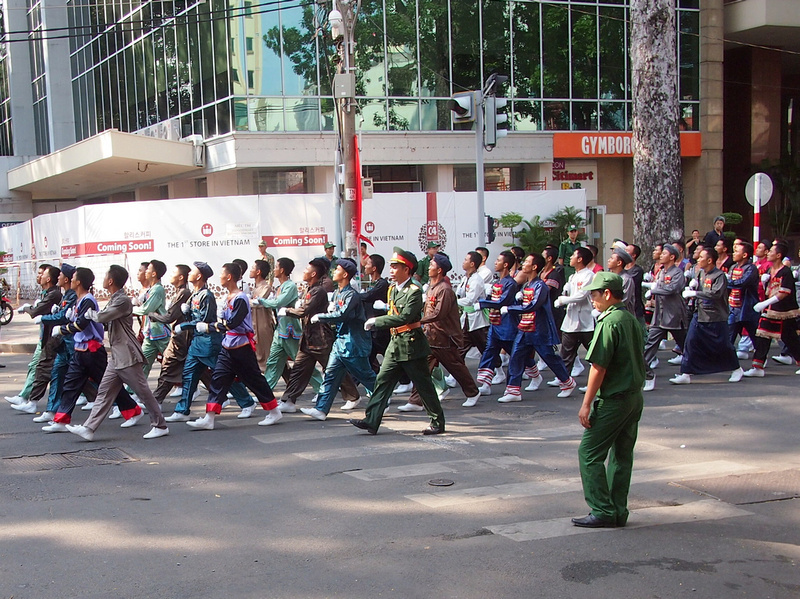 I went to a cafe and the ones that were open were full, people seemingly oblivious to the parade that was taking place 100 metres away. 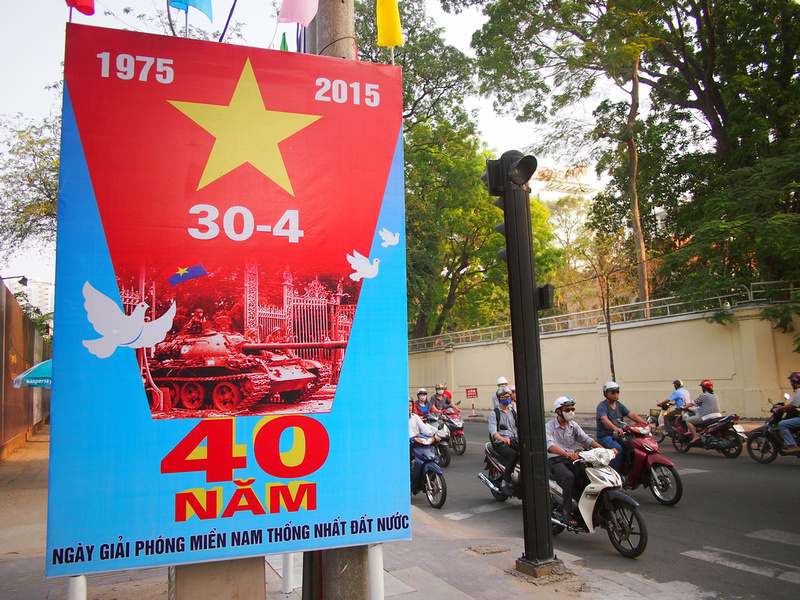 Photographer remembers Vietnam War 50 years after Australian troops arrive – Another anniversary this week was 50 year since Australian commitment to the war. This is an interesting story about a British photographer who was covering the war. This had to be an interesting and historic experience.